H.H. 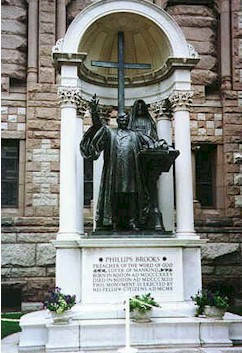 Richardson provided the "how" of Trinity Church, but Phillips Brooks provided the greater "why". Brooks can be considered the predominant American preacher of the 19th Century. His sermons were widely published and followed during the period. Though better known for writing the Christmas Hymn, O Little town of Bethlehem, he also delivered the sermon at President Lincoln's Funeral. Those of us who study the architecture and art of Trinity Church miss that to some degree these masterpieces were created because of Phillips Brooks. The old Trinity Church had been destroyed in the Great Fire of 1872. Brooks likeness appears four times in the church's architecture, testifying to his impact on the congregation. The decision to build a monumental building, requiring five years of construction, was almost certainly to provide a setting for their dynamic preacher. Richardson and Brooks had both attended Harvard, and been members of the Porcellian Club there. The competition for Trinity's commission pit Richardson against a number of more established architects. Even within Trinity there is a recognition that school ties probably influenced Richardson's selection. However as both Brooks and Richardson quickly rose to the top of their professions, the choice seems to have been well made. Shown here in Augustus Saint-Gaudens 1910 statue, Brooks is also commemorated on Trinity's porch (added in 1925), on the the pulpit, and by a bust in the baptistry by Lincoln Memorial sculptor Daniel Chester French.